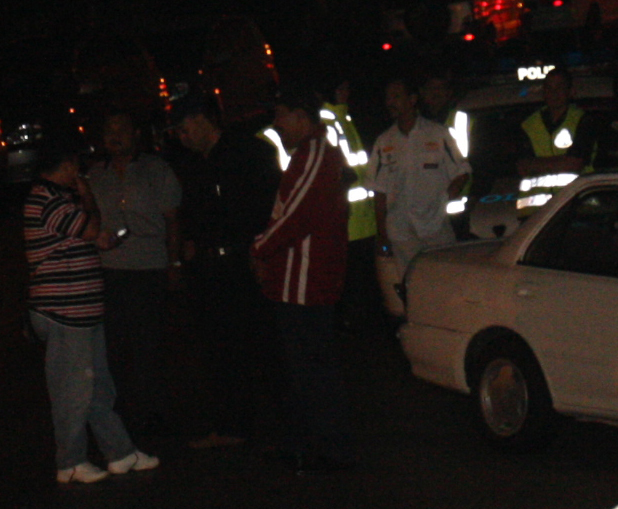 Here are some of the pictures of the solidarity vigil that was held at Blog House in Bukit Damansara, 14 September 2008. Our thoughts were not only with Raja Petra and Teresa Kok but also the Hindraf 5 and all other ISA detainees. We appeal to the good sense of the Badawi administration to abolish the ISA Act and free all victims who had been incarcerated without trial. 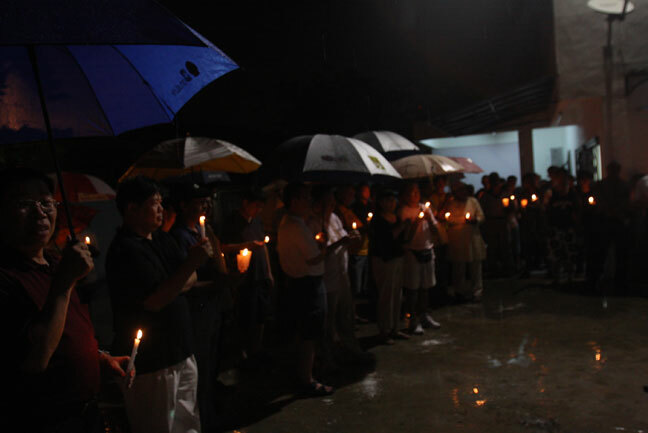 Even the rain could not dampen the spirit of those who came to show support. 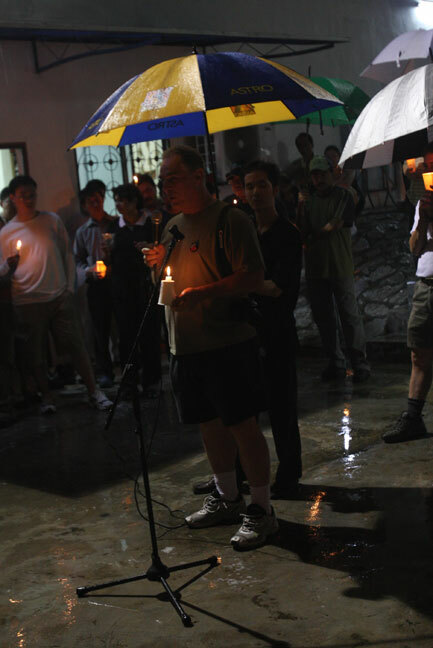 Here’s one brother who didn’t mind the rain and stood in the drizzle throughout the vigil. Ahh, we also have some ‘unexpected guests who also came to lend support’ although they chose to hold their ‘vigil’ outside Blog House. Unfortunately I couldn’t make it to the candle-light vigil. It is good that you attended and spoke. The ISA is unjust and unfair when used on civilians. RPK, Teresa and Hindraf leaders are NOT terrorists. They may disagree with the current regime on various policy matters. That is all. 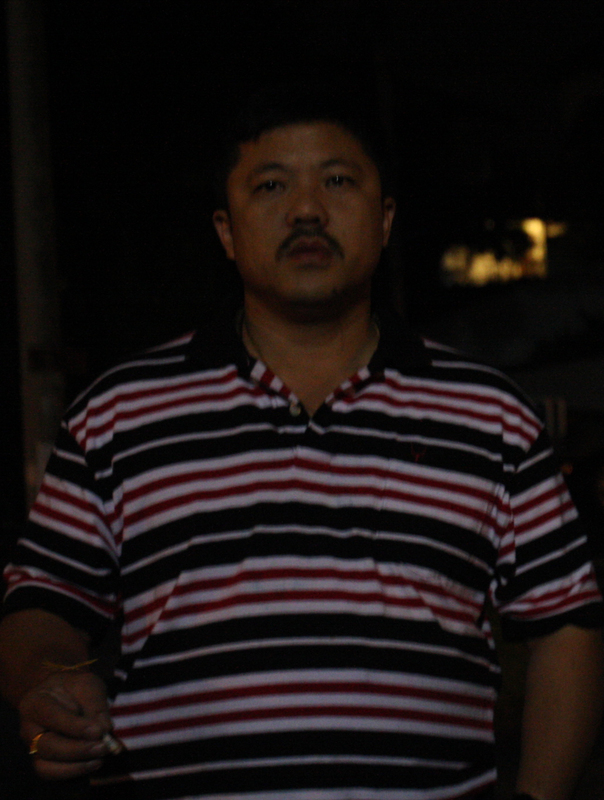 As for Tan Hoon Cheng, nothing can ever repair the injustice done to her even if it is for 18 hours. The mental torture is unacceptable. I am glad that all Pakatan MPs and components are united in this. I am also heartened that some BN leaders are coming around (tho’ their sincerity is subject to proof). Keep up the excellent work at Wangsa Maju and for our beloved Malaysia, YBro. I sleep easier knowing that you are keeping watch. 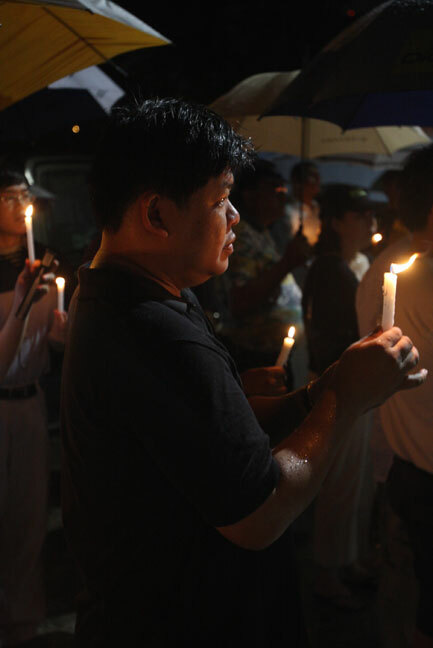 Ms Tan was an unfortunate victim of intimidation by the Badawi regime. I am sure that you and I wouldn’t want to be detained in order to be protected as stated by the Minister of Home Affairs. RPK and Ms Kok are obvious victims of the same regime. I shall do what I can to assist to secure their earlier release. I am also a victim of ISA and I do understand the sufferings that both RPK and Ms Kok are going through now. We must all fight against the use of ISA as no one should be detained without a proper trial in court. We must all be together to fight against the injustices perpetrated by this Badawi regime. This is freedom Badawi’s style! It is is always a pleasure for me to speak and fight against injustices done to the people. though i am against the using of ISA, if Ms Tan was detained under ISA to be protected as state of Minister of HOme affairs state. Than i think the utusan reporter also need to go thru the same thing. For Teressa, she should go thru what amad -penang go thru. and not ISA. can’t help wondering if ISA actually promotes inefficiency. From a process management point of view, if the police need not justify an arrest because of ISA, does this mean the follow up investigation could be slower? For example, in the office, if there is no deadline, no time pressure, would a staff perform his/her task faster compared to when there is no pressure? If the Investigation Officer feels that there is a national security threat, he has to quickly investigate and justify his arrest decision then take action. Such arrest would be more justifiable and creditable. If, on the other hand, is “catch now, justify later”, investigation process wise, may not be as efficient. I am talking from management science point of view, not politics. For sure there will be a hell lot of road blocks effective today 16th Sept until the bn finally exits from Putrajaya. As usual the police have the wrong priorities. Blocking roads instead of doing crime prevention. Hope that they won’t go to the extend of getting a court order to restrain Anwar from getting within 3KM radius from badawi. We are all nervous, i think it is natural for us to be worried. Our first time attempt to kicks out a government , we all should be worry. Lets us hope all will be smooth sailing not only for Anwar and PR but to all Malaysians whom are waiting eagerly and patiently to witness a change of government. The question of a new govt by sworn in by today is definitely not on! With so many peoples with evil intention to create havoc, this new govt can wait for all I care. We must be able to ensure a stable new govt politically and also the support of the majority of the citizens. While it is not morally wrong to overthrow a corrupt govt, we who ask for the right rule of law must also abide by the same law. If it is within the confine of the constitution that a new party with the support of a simple majority of MPs can form the new govt, then go for it BUT do ensure that the new party MPs can stay in place and not be bought over by bn. That would cause further unstability and with that our economy will spiral downwards with the masses suffering even more. I personally would like to see changes and a new govt with less political patronage for non tender projects etc but not at a price that’s detrimental to the people at large. For the new govt to rule, they must have the backing of the King and the state rulers as well as the backing of the military and police. I believe many of us wanted a fair and just govt and we wait to see that day coming and let good sense prevail over all else. Pesanan RPK buat rakyat Malaysia. A message from RPK to the rakyat. padan muka… mna leh 2 tahun….